Entering this tea shop makes you feel like you have gone back in time (in a good way)! There is a lot of attention to detail in this cafe, from the proper china tea cups to the matching cow milk pot. The darjeeling tea and the summer tea were both great. Contrast to the tea, the hot chocolate was normal. Soy milk is available. All the cakes looked good and fresh. We sampled the carrot cake. It was delicious and the portion was of a good size-definitely enough to share! This is a very authentic cafe with great homemade cakes. A cute feature is the tea cup chandelier! The only disappointment is that there is not enough seating and the seating that they do have, is very close together. Outdoor seating is very cramped and it is more like being in someone’s backyard. The cafe was extremely busy on the weekend that we visited it. If you do go to this tea shop, take a look at the air raid shelter in the basement. I’m a local to the area and I think Highgate really benefits from this great little café. The cream tea and hot chocolates are to die for and I can never resist going in! A great café with a lovely bustling atmosphere and I love the retro feel to it. Lovely staff and the owners/managers were really nice and helpful so it’s definitely a 10/10 from me! I totally agree – this place just keeps getting better, and it was great to start with! I live locally and this is my favourite place to go for a little treat. I often end up having a cream tea and a cake – what an indulgence! But with the smell of freshly baked cakes in the air, who can refuse?! The last time I went to High Tea of Highgate, they did not have a live piano/pianist. I have contacted Georgina at High Tea to see if they have a piano now. I’m just waiting to hear back from her and so will keep you updated! Is there a live piano/pianist here? Just got an email from Georgina Worthington. 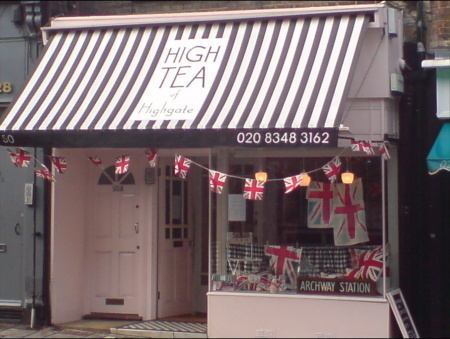 It's High Tea of Highgate's 1st Birthday. Happy Birthday High Tea of Highgate, from the Rate My Bistro team (Dina and Lee). We'll be popping in to congratulate in person sometime this week. So this time when we went back to High Tea of Highgate, it again did not disappoint! The winter tea tasted very warming with its almond and citrus flavours. The chocolate orange cake was yummy as ever. We were expecting it to be a chocolate sponge but it was in fact an orange cake with chocolate drizzled over the top. Very tasty! We are looking forward to their Xmas range of goodies, including traditional mince pies 🙂 We'll keep you updated on those…just watch this space! Just a note to say that the air raid shelter is no longer at High Tea. They now have a new exhibition on in this tea shop! 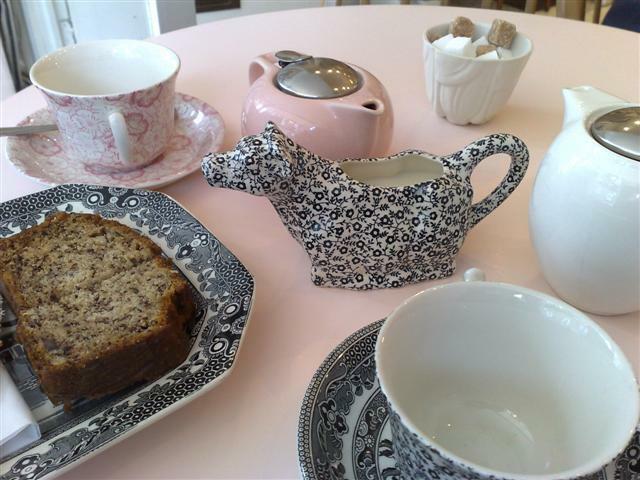 We recently went back to visit High Tea of Highgate and this cafe gets better with every visit. It’s such a local cafe with a great feel. We had the cream tea and flapjack. Both were really tasty and so fresh. We were told that the cakes are baked freshly every morning on the premises. The hot chocolate was good this time too, it tasted sweeter than before. The thing that we liked about this cafe is that you feel comfortable to chat to the stranger sitting on the table next to you. We also learnt that we had just missed Victoria Wood, a regular customer of this cafe! “Thank you very much for your kind review and including High Tea on your lovely website-it’s really great! Fantastic idea! Just for you to note, we changed our hot chocolate at the beginning of this week as I have not been happy with it-it’s hard to find a good organic hot chocolate! I think its much better now! I’m definitely going to try the cream tea on my next visit. The service was a bit slow for my liking, but everything else was just perfect. A really authentic retro cafe, a must visit for anyone.